let me know how can i use Whatsapp and nimbuzz and as well as wechat in N9.. why i feel like i have throw a money in dust bin.. nokia was the best now its no more i think so. i baught this mobile and i feel like i throw the money in dustbin. as there are no more application to download. now i wont be purchasing any more Nokia brand. AnonD-26593, 06 Jan 2013my dear, i have not faced any of your issues mentioned after overclocking to 1.3 ghz, along wi... moreruplee, i think you are really good at n9 phone, can you help me? i have installed this n9qt, and when i come up to "OO" which is to lock the application with password, it really works, after a while i have decided to "unlock application" at my MESSAGE and GALLERY, so i selected the number correspond to it, but still when i open the MESSAGE and GALLERY, it always ask for a password to validate, now i go back again to "OO" and selected the remove and restore to default, the next thing that happened is that i cant open now my messages, and the gallery, i have already reboot my phone, and still nothing happens i cant open my messages and gallery, and the gallery icon had gone and turned into blank green icon,what should i do, i am on PR1.3 please help, thanks in advance!!! AnonD-26593, 05 Jan 2013yes connor, u can install inception with home screen settings, well if u are on Pr 1.3, then y... moreif you are overclocking to 1300Mhz, Your battery will run out of juice in about 12h and is not stable, and heating up, but you will not see any much speed on your phone, it will annoy you time after time by freezing the screen every time you switch on your phone to see for a message or call, and if you use faasterN9, whip that app away, because there will be two-three unknown calls, if you answer that calls is going to confiscate some money from your phone account, that means app faasterN9 is cheating to look like someone is calling from England or India, they are expensive phone numbers like for this ladies on windows! 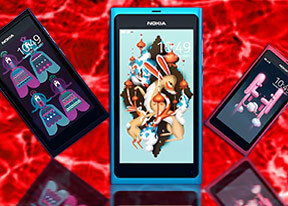 The N9 is good OS device, but it's left in middle of the roads, and is left for fun-boys and simplicit coders, that means only it's originality you can trust! yes connor, u can install inception with home screen settings, well if u are on Pr 1.3, then you should use inception 0.2.5 version. It would be much easier to install inception if you are using n9quicktweak mods, (mod-EE). connor, 04 Jan 2013i need help..is it safe to install inception if i have "homescreen setting" applicat... moreYou really don't need that, i have try it all and all it's kind of nonsense, then after sometime you will have to re-flash the phone, but if you like to have one other OS in it like Android, nemo, or real linux desktop on your phone, than it is proven that works, just in NitDroid are disabled camera and call functionality, the speed is like Sg2 strange! Inception and Homescreen Settings are compatible. The latest version of Inception is 0.2.5 (I'm pretty sure). OPPtimiser allows overclocking, providing you have Inception. Be careful, obviously. connor, 04 Jan 2013i need help..is it safe to install inception if i have "homescreen setting" applicat... moreInception and Homescreen Settings work fine together, and the latest version of Inception is 0.2.5, I believe. Be careful, for obvious reasons. Adi, 02 Jan 2013Hey, What i am looking for is just basic calls, texting, Whatsapp, Music, photos, facebook, t... moreConsidering what you're looking for, it seems odd to pick a phone without an official Whatsapp port (obviously there's the unofficial one though). The messaging side is otherwise excellent, and the phone and its OS definitely have the 'looks' thing down. It's overpriced in many countries though, up to you if the money's worth it. What i am looking for is just basic calls, texting, Whatsapp, Music, photos, facebook, twitter and Killer Looks! i think this fella scores well for these needs. Adi, 01 Jan 2013Hey guys!! Kinda confused here. Should i go for N9?? My options are N9, GalaxyS2, Lumia900... morelumia 900 all the way!!!!! Adi, 01 Jan 2013Hey guys!! Kinda confused here. Should i go for N9?? My options are N9, GalaxyS2, Lumia900... moreI think the N9 would be a solid choice. However it depends on what you're looking for in a phone. The N9 is a great phone, I had the 16GB black version, just a great phone. Kinda confused here. Should i go for N9?? My options are N9, GalaxyS2, Lumia900 and Xperia SL. I really can't figure out what to do. N9 seems kinda old, but i love its appearance and it seems exquisite.. Please advice, O wise people!!! N9 is a great phone and i luv it but after using n9 for 9month i had a problem in the mobile speaker so i repair it from the nokia care centre.after repairing i lost all the applications (the downloaded ones) n now i have a problem in downloading it.it isn't downloading .it only shows waiting.whats the problem?can somebody help?